I awakened the other day to the sound of heavy rain. My initial reaction was “Oh good, I can stay in my pajamas and read all day long!” I don’t know why I think I need a rainstorm to give myself permission to hang out in my PJ’s. Afterall, I am retired and can pretty much hang out whenever and whereever, wearing whatever, I want! So, I made a cup of hot water with lemon, found my book, and curled up on the couch, in my comfy pajamas. Shortly afterwards, the sun came out and I saw a beautiful rainbow in the sky. I smiled. There is nothing like a rainbow to evoke a reaction of surprise, immediately followed by sheer delight. Due to the fact that rainbows are not a daily occurrence, I am happy that the business world features the rainbow in its goods so that I can have a steady dose of them. I see rainbows silk screened on backpacks, notebooks and toys, on toddlers t-shirts, party decorations, and even sewn into quilts. Rainbows often appear on Get Well, Thank You, and Birthday cards with the intent of making the receiver feel happy. 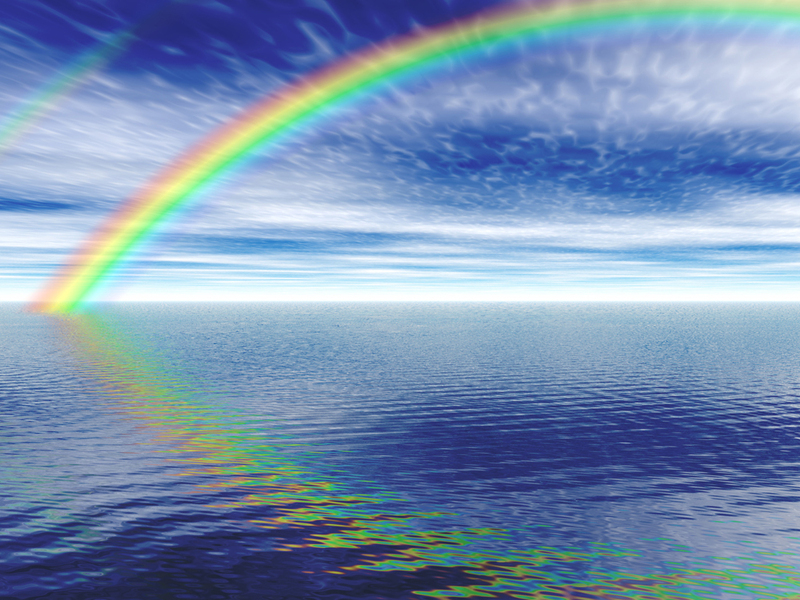 Whether engraved on a metal key chain or a real one high in the sky, a rainbow always evokes a smile from me. While I have always been delighted by the appearance of a rainbow, and I understand how they occur, I had not given much thought to the purpose of a rainbow before. Rainbows are caused by the reflection of sun light behind the rain drops, forming a spectrum of light across the sky. But other than the sun hitting the water drops at just the right angle to reflect the beautiful arc of color, is there something else? I think that rainbows appear like a reward after a rainstorm–much like a sign that all is well again. Just maybe, rainbows appear to alert us that this is the calm after the storm, the path to go forward and enjoy. Julia’s message reminded me that life isn’t always as we wish it to be. Often we find ourselves impatient while we wait for life to get better. Sometimes we need a good rainstorm to wash away the path we are on so we can create a new one. When the storm subsides and we have gotten through the sadness, disappointment, or pain, that new path is before us, as is the rainbow after the rain. I have spoken with several women with high SUCCESSTROGEN levels who shared their life story with me. Each woman described her various decades in terms of challenges and growth. Each woman spoke of her present state much like the rainbow after the rain. She is happy, self-assured, and in control of her life. She expects that there will be challenges ahead but she does not fear them because they are part of life. She will meet the new challenges and look up for the rainbow.